Another of the most important gods, and perhaps the one who has the most diverse forms, is the creator god, Tezcatlipoca. Originally he symbolized the night sky, and for that reason he is related to the stellar gods, to the moon, and to those that signify death, evil, or destruction. He was the patron of sorcerers and of highwaymen, but at the same time he was the eternally young, the Telpochtli, "he who never grows old," and Yaotl, "the enemy," the patron of warriors, and hence was associated with Huitzilopochtli. His name means "the mirror that smokes," because, as Pomar [Juan Bautista Pomar, a Mexican writer of the sixteenth century born in Texcoco. He was a mestizo, the son of a Spaniard and the grandson of the King of Nezahualpitzintli. In 1582 he wrote Relacion de Texcoco, It was published in the nineteenth century by Garcia de Icazbalceta, Mexico.] says his image was painted with soot containing shining metallic flecks which the Indians called tezcapoctli, or "shining smoke." Tezcatlipoca was primarily the god of providence; he was omnipresent and omniscient in all human affairs. Consequently, directly or under one of his many names, he was worshiped not only in Tenoch-titlan but also in many other parts of Mexico, and especially in Texcoco. 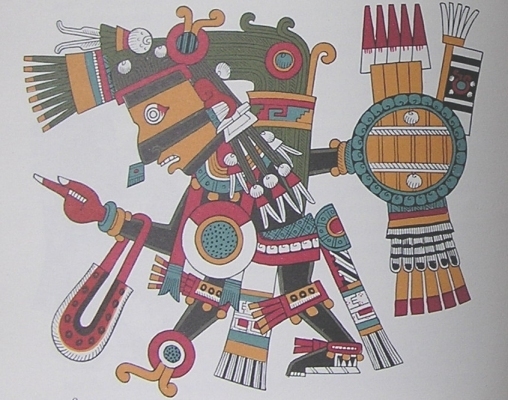 In some ways he was akin to Huitzilopochtli, and in others he was his opposite; for Huitzilopochtli represented the blue sky, the sky of day, while Tezcatlipoca personified the black or night sky. He was the warrior of the North, while Huitzilopochtli was the warrior of the South. He was also the discoverer of fire, even though this element had as its special patron the god Xiuhtecuhtli, the lord of the year, also called Huehueteotl, the "old god," and Ixcozauhqui, "yellow face." Tezcatlipoca was the patron of princes, and he himself was called Nezahualpilli, "the prince who fasts," and under the calendar name of О me Acatl, he presided over feasts and banquets. His fetish was the flint or obsidian knife, and so he was called Tecpatl or Iztli; he was the lord of cold and ice, with the name of Iztlacoliuhqui, "the curved flint knife"; he was also the god of sin and misery. The jaguar, Tepeyolohtli, "the heart of the mount," was his disguise. He presided over the homes of both young warriors and bachelors, over Теlpochcalli, the popular school of war attended by the young plebians, while Quetzalcoatl was the patron of the Calmecac, the school for the nobles, from whom the high chiefs of the army, the priests, and the judges and the kings were chosen. I believe that she is truly a goddess, that she is really very beautiful and fine. I shall have her, not tomorrow nor the next day nor the next, but right now, at this moment, for I, in person, am he who ordains and commands it so. I am the young warrior who shines like the sun and has the beauty of the dawn. Tezcatlipoca can be identified in the codices by the smoking mirror that he wears at his temple and by another which he wears in place of the foot torn off by the earth monster, as recounted in a myth explaining why at times in more southern latitudes one of the stars of the constellation Ursa Major disappears from the heavens, below the horizon. Being a nocturnal god, Tezcatlipoca was also painted black, but his face was striped with yellow and black horizontal bars. This decoration, known by the name of ixtldn tlatlaan, characterizes all the Tez-catlipocas, but in Xipe the colors change to red and yellow, and in Huitzilopochtli to blue and yellow. Tezcatlipoca's hair is cut in two different lengths, a style called tzotzocolli, characteristic of warriors; and the god carries the aztax-elli, an ornament of heron feathers; the shield, the chimalli; the dart hurler, dtlatl; and the darts, tla-cpchtli—all of which mark him as a warrior. Since the Aztecs considered the North the homeland of the hunting tribes to whom they gave the generic name of Chichimecs, the god of the Chichimecs, Mixcoatl, god of the hunt, was also related to Tezcatlipoca. What has been said of this god that existed among the Aztec deities and demonstrates that only by a minute analysis of their attributes and the myths about them can we hope to understand the nature of the gods and the mysteries of their cults.